Adding value to the packaging has become a very important trend in product placement. Hot foil stamping as a means of augmenting printed packaging is on the increase. As our aim is to offer our customers quality and responsiveness, we decided to acquire a new hot foil embosser in 2017. After a solicitation phase, we visited Shanghai on 27.03.2017 where we had the possibility to inspect and test the machine in the producer´s facitities. 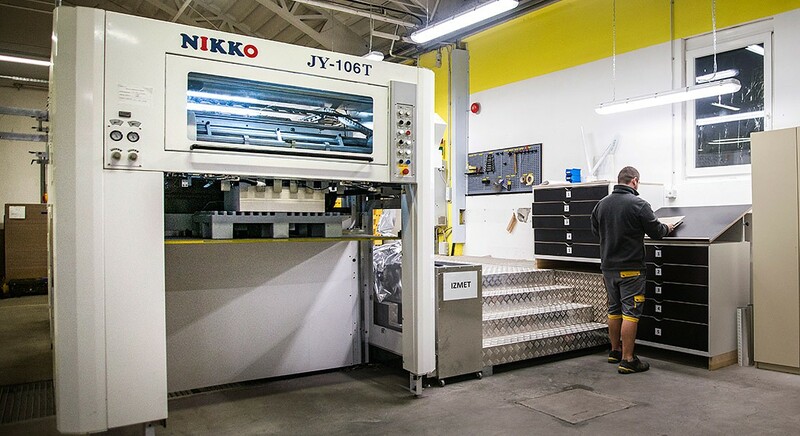 On 18.04.2017, we placed the order for a NIKKO – YOCO JY hot foil embosser. It was shipped to the port of Koper on 18.04.2017, from where it was transported directly to our production site. With the help of a specialist from the company YOCO from China, we started the installation of the machine. On 06.10.2018 we signed the acceptance report and started routine work on the machine.